I just went out to check up on my babies in their vegetable patch, The beetroot, lettuce, onion and potato are looking great in the garden! But something has been eating my cauliflower and brocolli leaves :( Yesterday I found teeny tiny caterpillars on them, most likely laid by the result of a flyby romance. This morning, I found aphids. Only 3 of them, huddled together under a leaf, and a greeny cloloured ant scurrying on top of the leaf. This made me think of a National Geographic movie I watched once upon a time. In the documentary, there was a branch covered thickly in aphids. A lady bug came along, walking on the branch, and was enjoying her/his very convenient smorgas board. Al fresco. Suddenly, an ant, the great aphid protector, started running along the branch, and the lady bug took off quick smart! And then the ant, in all its glory, walking gently over the aphids, was offered some kind of fluid bubble from the aphids mouths and the ants drank it! 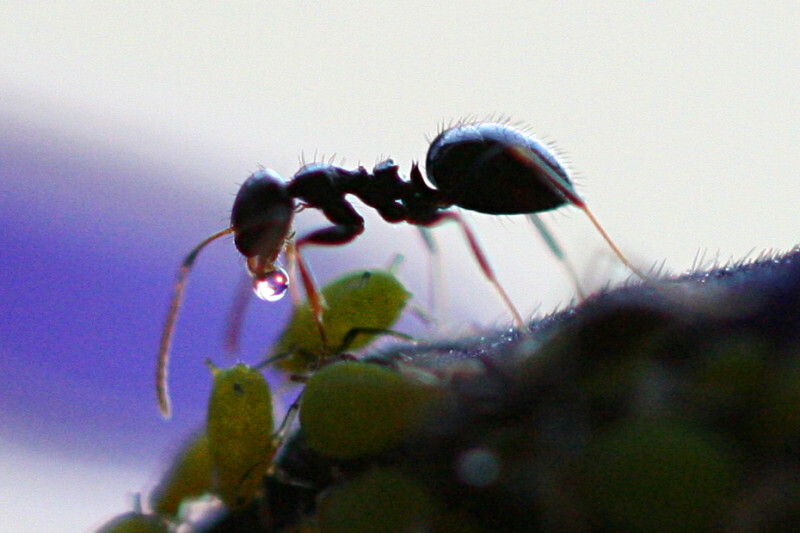 An ant receiving honeydew from an aphid. Photo via wikimedia commons. Hmmmmm, is that what is happening in my garden? Have they planned some kind of alliance because Kelly's vegetable patch is chemical free and its just simply a great place to hang out? I have read about companion plantings and natural pest deterrants, but the things I have read about don't seem to be working ........ yet! I have soaked onion and garlic in water and sprayed my garden with that to keep pests away. Maybe I didnt spray enough. I have even planted marigolds in the middle row of the vegetable garden because they release pyrethrum which puts bugs off. There is only one flower that has opened so the pyrethrum smell must not be that strong. I remain hopeful. I will not use chemicals, herbisides or pesticides in my garden. We get to eat enough of that crap when we buy pre packaged foods or produce from the big shopping centres. I have yet to try soapy water ........ but today, I plan on totally soaking the plants in the left overs of my onion garlic water ...... hopefully that will pong the bugs away ...... but if not, I will go with the soapy water method during the week. Where there is a will, there is a way! Have you used anything to keep bugs away that actually works? Heres to happy gardening ! in the meantime, look to neem oil or cayenne or insect management. good luck!